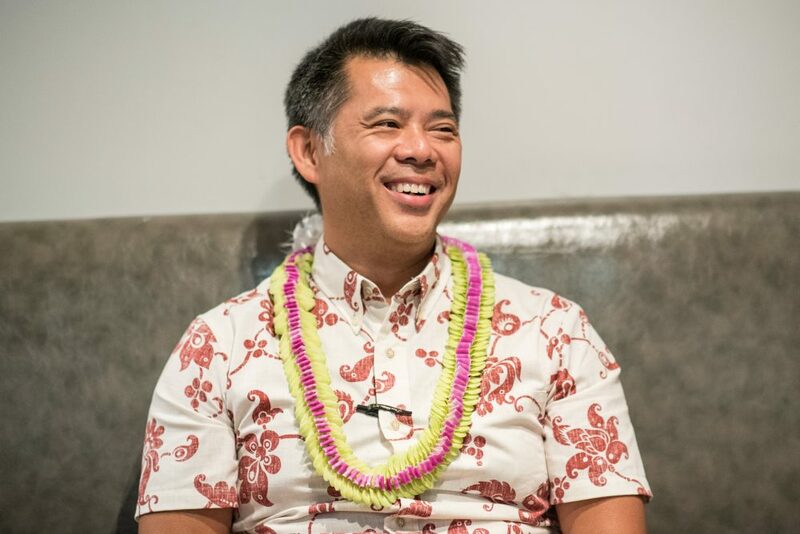 Keoni Chang is corporate executive chef of Foodland Super Market in Hawai‘i. Before taking part in a Zócalo/Daniel K. Inouye Institute “Pau Hana” discussion titled “Why Is the Mainland So Fascinated By Hawai‘i’s Food?” at Artistry Honolulu, he spoke in the green room about the X-factor in Zippy’s chili, his plans to read David Sedaris, and his grandmother’s canned salmon with brown sugar and soy sauce. Was there a formative experience that got you so interested in food? I’d say it was subconscious, growing up around food. My great-grandmother was an amazing cook and she did everything from scratch. And then just being in Hawai‘i you’re very surrounded by food. Food is a very important focal point of get-togethers and family. But as it pertains to professional cooking, I was going to the University of Hawai‘i and studying graphic design, and I wasn’t really feeling that. I had heard about culinary [school], and I had this stigma that it was sort of Mel’s Diner, and I thought, “I’m not going to do that.” But I learned there was this whole other thing where you could do food in a special way, and I thought that maybe I could do food as a medium. Was there something you really liked to make as a kid? Well, I used to enjoy doing a lot of the prep when we would go to have beach gatherings. So whether it was prepping chicken thighs to be grilled or whatever …. And then I do remember simple, home-cooked dishes that I would enjoy eating that my grandmother would make, that literally was like canned salmon with brown sugar, and they would pour hot oil and soy sauce on it. You’re having a dinner party, and you can invite three or four historic figures. Who would you have? I think Thomas Jefferson would be one. Maybe Bernice Pauahi Bishop [a philanthropist and noble of the Royal Family of the Kingdom of Hawai‘i] would be another. I’m stuck now! I’ll probably come up with a million ideas after this is done. And you want to know why? Well, I guess Jefferson is kind of obvious—polymath Renaissance guy, right? And he was a big foodie! Oh, and Warren Buffett, Steve Jobs, and Elon Musk. When I moved to the mainland it was easy to identify all these things that I longed for. It would be Saimin noodles, which is like our version of ramen, but it’s thicker, chewier, has a clear broth, green onions. That’s super delicious. One of the other things, I would say, is Zippy’s chili. There’s a restaurant here called Zippy’s, and they make chili, and everyone from Hawai‘i loves that chili, and to them that’s kind of what Hawai‘i is. Many people have tried to figure that out. People think it’s because they put mayonnaise in it, or they finish it with peanut butter. No one knows exactly. Another comfort food could be like a plate lunch, which could be beef stew or chicken katsu with a couple scoops of white rice and macaroni salad. And there’s a place down here called Young’s Fishmarket, and they make amazing laulau and pipikaula. There’s many versions of it, but their version is like a soy-marinated beef that’s air-dried. So you buy that and then you pan-fry that, and then you cut that up, and having that with some really good kalua pork and lomi-lomi salmon, and some poi. And poi is interesting, too, because where I was raised we would eat it lightly fermented, so we would call it “two-day-old poi.” To me, that would be another really comforting dish. If you weren’t doing this, what would be your next career? I would be an electrician. [Laughs]. I’d be a standup comedian, that’s what I’d be. Are you reading anything for pleasure? I’ve been buying a lot of cookbooks and I read those for pleasure. I’ve been thinking about getting some David Sedaris. He was doing an interview with Terry Gross this week. He’s on my list that I’ve got to read. Actually it was from André Soltner. He was the chef-owner of Lutèce in New York City. He was a very well-known chef, very well-regarded in the culinary industry. And as I was starting my career, someone suggested that I try to meet with him, and he was teaching at the International Culinary Institute. So he sat with me, we had lunch together, and one of the things he really advised me on is, if you’re going to cook—or for that matter if you’re going to do anything—you should do it because you want to do that, and you want to do that in the best way you possibly can, not because you’re chasing money and not because you’re chasing fame. You should be doing it for the purity of what that is. And I think that was really good advice. The other things all fall into place, he said, but you have to do things for the right reasons.